“Hawaii – Island of Fire” is an insightful report into the Kilauea eruption and its impact on the residents of Leilani Estates as well as the government officials who are tasked with managing this disaster. While the eruption of Kilauea has been nothing short of spectacular and tragic at the same time, it is with note that I remind readers that the eruption’s lava flows are impacting less than 5% of the Island of Hawaii (Big Island). While sensational reports of the eruption have been shown worldwide, officials at the State and County of Hawaii remind would-be visitors that Hawaii and the Big Island is open for business. The port in Hilo is open as well as all of the airports on the Big Island and the rest of the state. Tourists are encouraged not to cancel travel plans. Those visiting the Big Island are urged to patronize island businesses in the Puna and Volcano area. 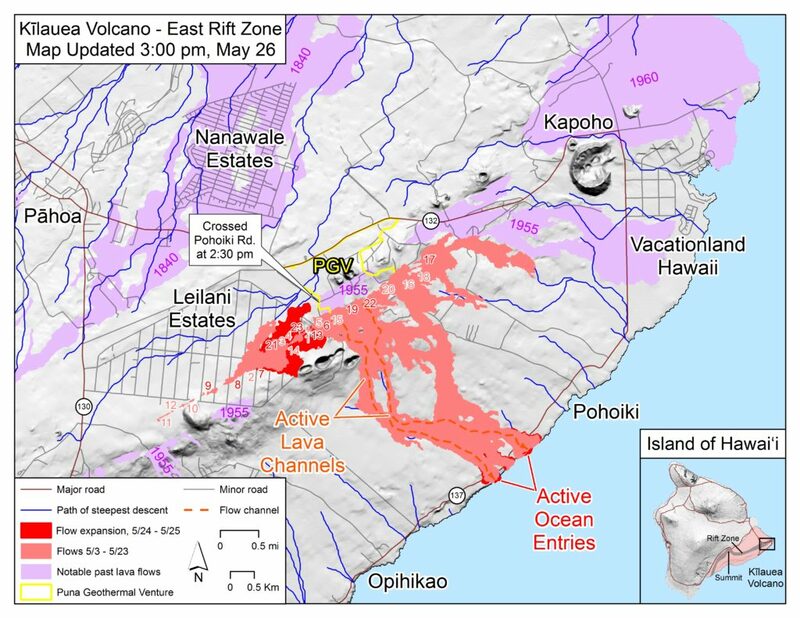 The USGS map below show the impact of the active lava inundation areas as of May 28, 2018. Be sure to check our Hawaii Volcano Videos collection on YouTube. It is a 500+ list of the most relevant videos pertaining to the current eruption with some historic ones thrown in. ← It’s Honokaa Western Week!